Clarity will be available on DVD and VOD on August 22 2017. Peyv Raz's Clarity is an extremely impressive feature film directorial debut which is intense, thought provoking, meaningful and incredibly important in so many ways with a truly explosive finale. With it's tale of two world's colliding to save one girl's life, Clarity deals with many issues and themes on social, political and emotional levels. What begins as a film that looks like it could be light and fluffy with a feel good ending, deceives everyone with it's dramatic tension and ability to make you question the things you believed you always had an answer for. Clarity is extremely well crafted from the very beginning with it's visual comparisons of a privileged life in Las Vegas as opposed to the simple, but harsh and hazardous conditions of rural Mexico. This comparison is one that is vitally important to the story, as the film is undeniably a tug-of-war of love and power between 20 year old Maggie's (as portrayed by Dana Melanie) adoptive American mother, Sharon (Dina Meyer) and her Mexican birth mother whom she was stolen away from, Carmen (Nadine Velazquez). In other words, it is the age old battle of higher and lower socio-economic classes taking place, but in the name of love for a girl both women love and care for with all their hearts. The terrifying social issue of human trafficking is here seen in the most personal of ways and shows the awful effect it has on the parents left behind. 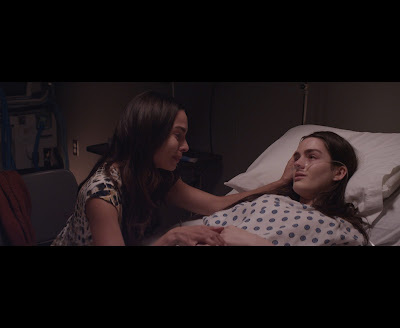 This struggle is one that is evidently one-sided at the beginning of the film, as Sharon holds the upper hand by tracking down Maggie's birth mother and reuniting the two. It almost seems deceitful, as we know her intentions are not quite as simple as they seem, but makes you question what you would do in her place. It is a mother's love that makes her behave the way she does, and the intensity of a mothers love can often neglect rhyme and reason. This power tends to shift throughout the film, and this is when Clarity takes an intriguing turn. The second half of the film is superior to the first half thanks to it's unexpected twist, unpredictability and outstanding performance by Nadine Velazquez. Velazquez commands every scene she is in and her strength of character is magnificent, especially in the way she changes so greatly in a way that still remains believable and truthful. However, it is the finale of Clarity that lingers long in your mind. It is completely surprising, but also shrouded in the most gratifying sense of mystery that brings out the cleverness of Raz's screenplay. Clarity has the ability to make you challenge your beliefs and see a horrendous, layered situation from two equally important sides. A film which is as important as it is captivating and entertaining. Clarity - Trailer from Peyv Raz on Vimeo.